Toast almonds in a skillet over medium heat for a couple of minutes or until golden. Remove from pan to cool. Cut watermelon into 8 even pie shaped wedges. 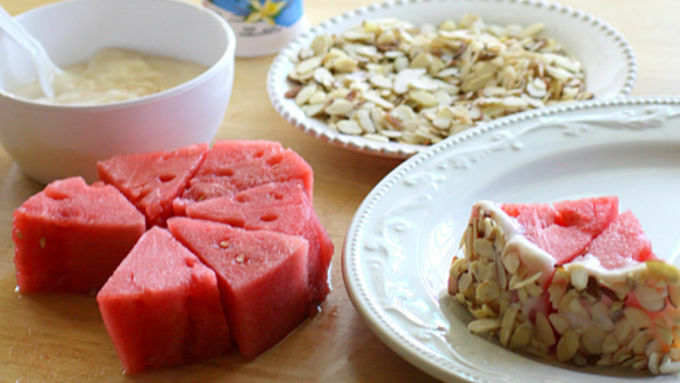 Dip outside curved edge of watermelon in yogurt then in sliced almonds and place on serving platter in a pie-shaped formation. 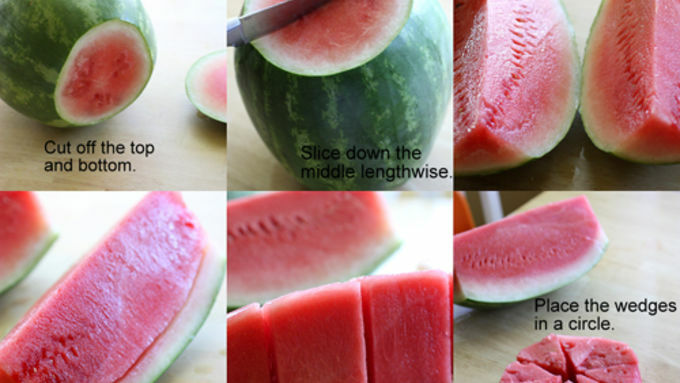 Repeat with remaining watermelon wedges. Once all of the wedges have been placed in a pie shape, use the remainder of the yogurt to frost the top of the pie. Place blueberries and sliced strawberries in a decorative pattern on top. Serve immediately or chill until serving. This dessert lets you have your “cake” and fresh fruit too! A refreshing Watermelon Tart that's low in sugar but will satisfy that sweet tooth. 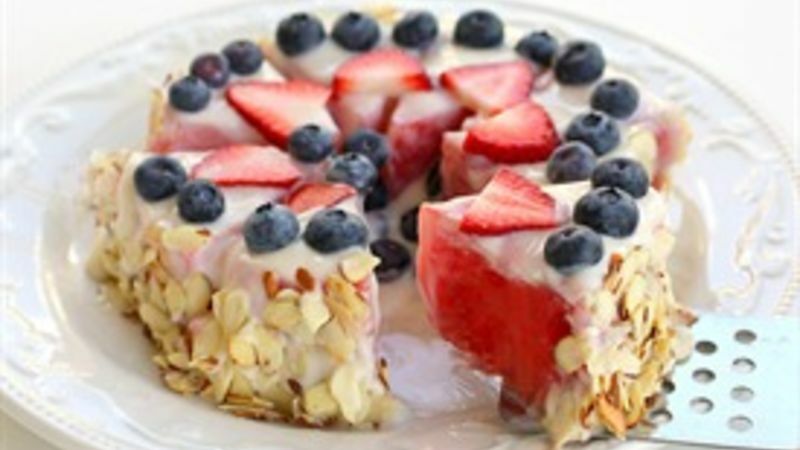 Although it looks like it’s loaded with calories, this tart is actually made from, well, as the name says, watermelon slices lathered with low-fat vanilla yogurt and berries. This impressive dessert will not heat up your house with a hot oven -- no baking here. The “crust” in the tart is made from rolling each yogurt-covered slice in toasted almonds for a nutty crunch. Now, you don’t need the whole watermelon--just about a quarter of it, but I’m sure the rest will disappear quickly. They say you eat with your eyes first, and this tart looks like a lusciously decorated cake. But you won’t be disappointed because this time of year, the natural sweetness of the watermelon and berries with the refreshing yogurt is a treat in itself! 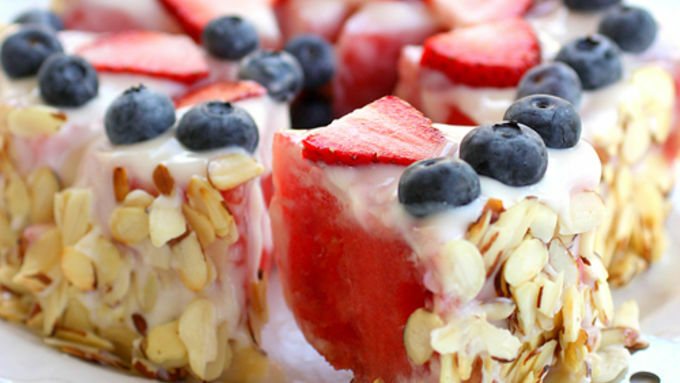 If you're craving watermelon this summer, try some of these watermelon recipes too!